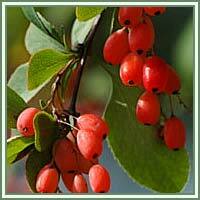 Habitat: Barberry is native to central and southern Europe, northwest Africa and western Asia. It can be found on edges of fields and forests. Description: Barberry is a deciduous shrub, growing up to 4 meters in height. It has a gray-yellow, grooved stem and thorny branches. Leaves are borne in clusters of two to five, usually small and oval, toothed along the margins. 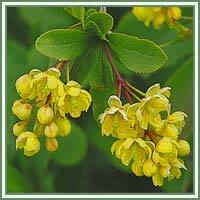 Flowers are bright yellow, produced on long panicles from April to June. The fruits are oblong red berries, produced in dark drooping bunches during autumn. Useful components: Berberine, berbamine, oxyacantha, glucose, fructose, malic acid, pectine, vitamin C.
Medicinal use: Barberry is considered to be antibacterial, anti-inflammatory, hypertensive, haemostatic, diuretic and vasodilator. Due to its constituent berberine, Barberry can act as a very efficient remedy against bacterial, viral, fungal and parasitic infections. Some studies suggest that berberine may be responsible for successful treatments of Escherichia coli and Pseudomonas aeruginosa. Barberry can stimulate digestion, reduce gastrointestinal pains and ameliorate our immune system. It can promote the secretion of bile and help in the treatment of gallstones. Barberry decoction is very beneficial in treatment of sore throat (used as a gargle). Safety: Excessive consumption of Barberry may lead to the occurrence of side effects, such as diarrhea, vomiting, convulsions, dizziness, nosebleeds, kidney failure and swells of skin and eyes. Mixtures made from crust of barberry are forbidden to children, pregnant women or women during lactation. Use it only under supervision of a qualified healthcare practitioner.